Annie Lewandowski (center) leads Powerdove. Never heard of 'em? Well, you just did! As both musicians and music fans, you've undoubtedly been thinking, who is going to rock my world in 2011? Rest assured, we've been pondering that same, most pressing issue, more than you can imagine, in fact. To that end, we've come up with a list of 15 artists - some of them you know quite well, others you've probably never heard of - that we're sure will be worth keeping a close eye on over the next 12 months. Oh, and why 15 acts, you may ask? Because everybody else does 10 - we're different that way! 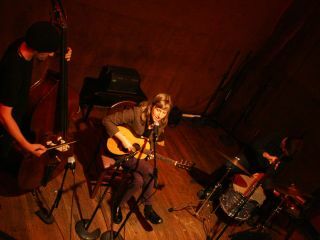 Although they're a trio (there's Jason Hoopes on bass and Alex Vittum on percussion), Powerdove centre around Annie Lewandowski, whose haunting vocals and parlor guitar stylings will rattle your heart and soul. The group's full-length debut, Be Mine (due out 15 February), recorded by Deerhoof's John Dieterich, is a bewitching blend of '60s girl-group love songs and intoxicating, ethereal, pastoral folk. The song Paint is from the band's self-titled debut EP, which can be ordered here. Over the course of 2010 James Blake made quite a name for himself among dance music circles. A string of jaw-droppingly accomplished releases - like Air And Lack Thereof and CMYK - marked him out as one of the UK's most promising young producers. Blake's earliest releases sat at the more leftfield end of dubstep, but as time has gone on his work has become more vocal-heavy. His recent cover of Feist and Chilly Gonzales's Limit To Your Love - which features Blake's impressive vocals throughout - is a good indicator of the direction he is heading in. His debut album, which is set for a February release, takes influence as much from Bon Iver and Antony And The Johnsons as it does Blake's dubstep roots. We've heard it, and can tell you it's one worth getting very excited about. Anna Calvi's debut single Jezebel was first made famous by no less than Edith Piaf, and comparisons to that legendary French songstress are already swirling around the young Brit-based singer/guitarist, who has also been likened to Jeff Buckley and Polly Harvey. Longtime Harvey conspirator Rob Ellis produced Calvi's eponymous debut album, although it doesn't include Jezebel, so you'll have to download it separately. Nonetheless, we've heard the LP, and it's a wonderful debut, packed with dark, sensual anthems,sultry vocals and stunning guitar atmospherics. Los Angeles-via-Michigan singer-songwriter Ben Schneider pretty much does the one-man band thing on his EP, Mighty (the follow-up to his debut EP, Into The Sun), and he does it pretty darn well. A mixture of Afro-Carribean meets Eastern flavored rhythms, drenched in reverb and resplendent with lush harmonies, Mighty's got it all and then some. Word is that Schneider, er, Lord Huron, has put a group together and plans on taking his act on the road. We're looking forward to what comes from all of this. In a recent interview Flaming Lips singer Wayne Coyne announced that the Oklahoma band plan to release a new song every month in 2011. While the band aren't the first act to employ such a tactic (Kanye put out a new track a week for several months last year) the Flaming Lips' penchant for bizarre methods of release means this could be interesting. Hip-hop production's biggest name has been working on his album Detox for nearly a decade now. It's become rap's answer to Chinese Democracy - in terms of repeated delays at least, not (we hope) musical direction - but we're promised it will finally land in 2011. Fingers crossed it might be worth the wait. Yes, we mean THAT David Lynch. At the end of last November the legendary surrealist director quietly released two surprising electro pop singles. The tracks - which came out on Sunday Best, the label operated by DJ/Bestival-founder Rob Da Bank - were surprising not only because they were unexpected but also because, unusually for a film-maker turned musician, they were actually really good. Rumour has it that the director is planning a full-length album this year. If the dark, off-kilter '80s vibe of those early tracks is anything to go by it could turn out to be quite a treat. They've been around a while, this LA-based, all-female quartet, and they've enjoyed the services of Chili Peppers both past and present (John Frusciante and Josh Klinghoffer, respectively). But after years of hard knocks and promises of "It's gonna happen for you," Warpaint, who released their trippy-yet-oh-so-hooky debut album, The Fool, last October, look like they're finally ready for the big time. Speaking of John Frusciante and Josh Klinghoffer, millions of Chili Peppers fans across the globe are already waiting with bated breath to hear how the latter fills the shoes of the former on the band's spring release. Check out the above video in which Klinghoffer, a longtime friend of the group, played alongside the man he would soon come to replace. It's been a long time since we've had the pleasure of a new Aphex Twin album proper. But in recent interviews Richard D James has claimed he's got around six albums of material completed, ranging from new avant-garde experiments to reworked old off-cuts. Surely at least one record's worth will make an appearance in 2011? Essex-born Jessica Cornish (aka Jessie J) is a 22-year-old, Brit School trained R&B/pop singer who is set to shoot to fame - and probably divide opinion - in 2011. Whatever you think of her catchy, slightly-bratty take on Rhianna/Gaga-esque pop, Jessie J already has songwriting credits for Justin Timberlake, Chris Brown, Miley Cyrus and Christina Aguilera under her belt, and that's undeniably impressive. 2011 is likely to see her turn into an unstoppable force in pop. Over the last few years leftfield electronic label Hyperdub - headed up by bass-music innovator Kode9 - has been a consistent source of fantastic, forward thinking dance music. 2011 is likely to be a particularly interesting year for the Hyperdub stable, however. For one thing, April will see Kode9 team up once again with his longtime vocal collaborator Spaceape for a full-length follow up to their critically acclaimed 2006 album Memories Of The Future. What is more concrete is that Burial has been commissioned to remix Massive Attack's latest LP Heligoland, which should appear sometime late 2011. It'll be interesting to see what these genre defining producers return to the fold with. Meanwhile, Hyperdub as a whole is sure to be as consistently interesting as ever this year. Last September, when drummer Mike Portnoy announced that he was quitting Dream Theater, the reaction from the group's loyal fan base was one of uniform shock and dismay. After all, Portnoy, a virtuoso musician who has received just about every 'best drummer' accolade in existence, was more than a founding member (along with bassist John Myung and guitarist John Petrucci) - he had his hand in practically all of the DT's doings. Despite their Southern-tinged name, these Chicago young'uns (none of the members are old enough to buy a beer in their native US) are more influenced by early Bowie and T Rex than, say, Skynyrd. Their self-titled debut was a rocking, giddy, filled-with-pop-hooks winner. In a couple of weeks, The Smith Westerns - great name, huh? - release their second album, Dye It Blonde, which features the bouncy yet atmospheric first single, Weekend. The forever-feuding Gallagher brothers went all the way in 2009, resulting in Noel's decision to up and leave Oasis. Undaunted - defiantly so - Liam grabbed group members Gem Archer and Andy Bell, along with the band's touring drummer Chris Sharrock, and formed Beady Eye. OK, so it's not the greatest of monikers, but so far, the music seems solid enough: the first single, Bring The Light, from the outfit's debut album, Different Gear, Still Speeding, hit number one on the UK indie and rock charts. In true Gallagher fashion, Liam has boasted that Beady Eye will best anything he ever did in Oasis. We'll find out soon enough, as the Steve Lillywhite-produced Different Gear, Still Speeding drops 28 February.